Cortel Group’s much-anticipated CG Tower is the fifth and final tower in the master-planned community of Cortel Group’s Expo City. 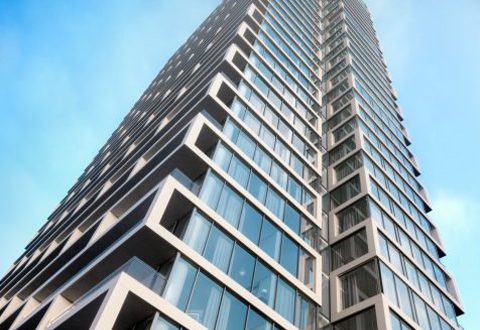 CG Tower is announced as not only the tallest tower in the development, but also the tallest tower in the City of Vaughan. 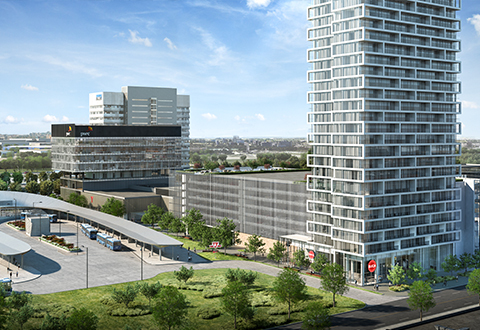 SmartCentres Real Estate Investment Trust (“SmartCentres”) (TSX: SRU.UN) and the Penguin Group of Companies (“Penguin”) owned by Mitchell Goldhar announced today that they have entered into another joint venture with CentreCourt, to develop two additional Transit City Condo towers in SmartCentres Place at the Vaughan Metropolitan Centre (“VMC”). 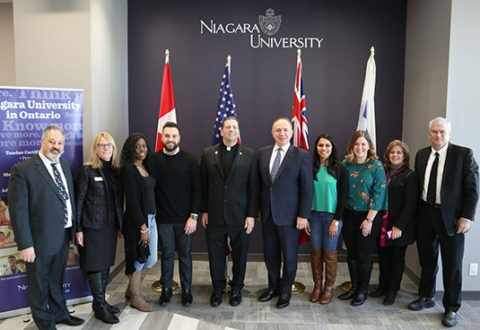 This marks a historic day for the citizens of our community as classes begin at Niagara University’s modern new site located in the Vaughan Metropolitan Centre (VMC). 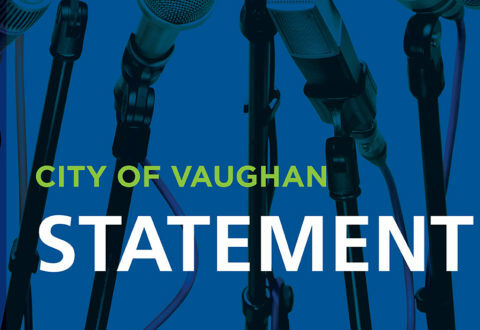 Mayor Maurizio Bevilacqua formally welcomed students, professors and members of the administration on the first day of studies at the university’s new location, adding that he has “proudly delivered on a transformational city-building commitment to bring the first-ever university to the city of Vaughan. 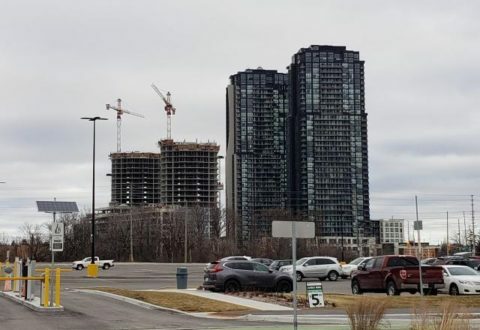 Cranes dot the landscape of the emerging Vaughan Metropolitan Centre, a nascent business district forming around the new TTC subway station which opened as the University line’s new northern terminus in December 2017. Several projects are underway in the blocks surrounding the station, set to add thousands of new homes as well as office space and additional transit improvements in the coming years. 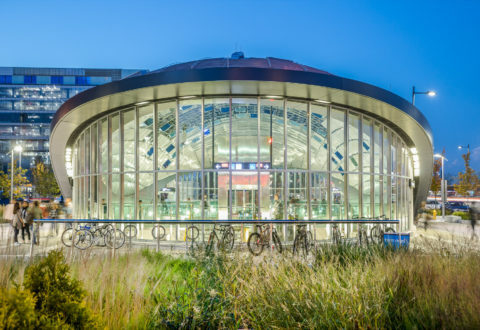 The highly contemporary Vaughan Metropolitan Centre Subway Station is an artistic jewel on Toronto Transit Commission’s (TTC) Spadina Subway Extension project. 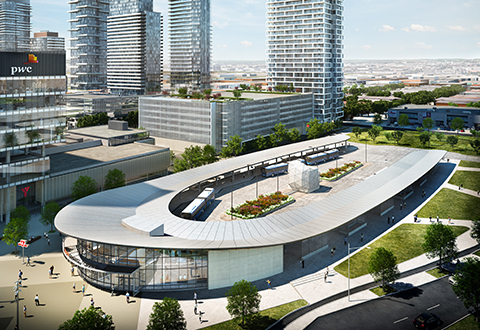 The new TTC subway terminus at Vaughan Metropolitan Centre (VMC) is fostering a wave of development proposals in the nascent Downtown for the suburban city to the northwest of Toronto. Among the latest to land at Vaughan’s planning department is for Block 3, a site south of Highway 7, with Commerce Street limiting it on the west and south, and Interchange Way on the east. 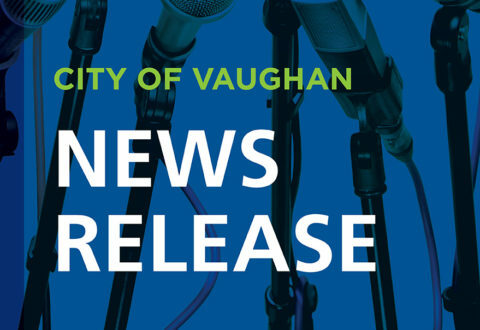 The following is a statement delivered by Vaughan Mayor Maurizio Bevilacqua to celebrate the City of Vaughan winning the Ontario Traffic Council’s Project of the Year Award for the Vaughan Metropolitan Centre (VMC) Mobility Hub. 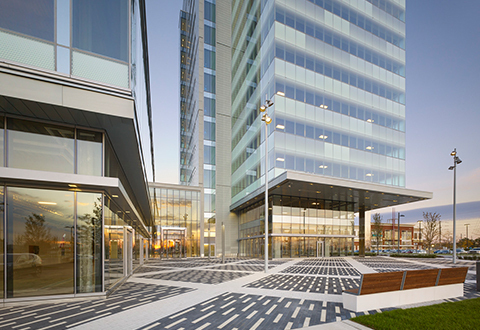 Vaughan’s emerging downtown remains a leading destination to attract economic development, build public transit and create new and innovative neighbourhoods. Gioia Di Giovanni loves downtown Toronto. She just doesn’t want to live there. Di Giovanni, 36, works in healthcare in the 905 and owns a condominium in Richmond Hill, close to where she was born and raised. 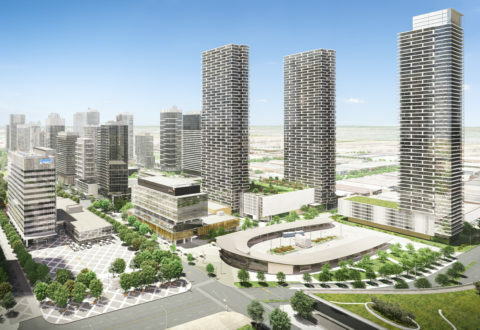 She wants to move up to a larger condo south of her current address and has found the perfect solution at Transit City — the first residential tower that will be built at Smart Centres Place in Vaughan, a 100-acre master-planned development. Joint venture partners Smart Real Estate Investment Trust (SmartREIT), Mitchell Goldhar and CentreCourt Developments have released details of a planning application for the development of Transit City, the first residential condominium tower in the SmartCentres Place, the largest urban development in the province. 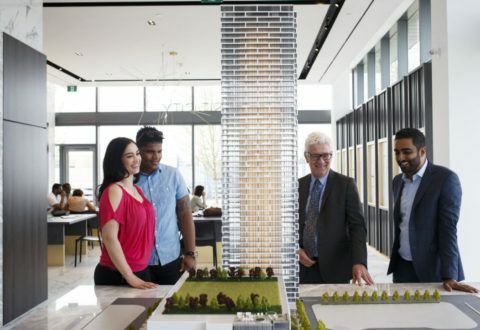 A 55-storey, residential tower that will be the tallest landmark on Vaughan’s emerging skyline, is being touted for bringing a distinctly urban vibe to that city’s ambitious downtown plans. 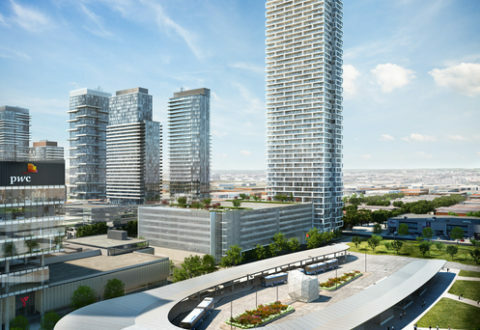 CentreCourt Developments’ Transit City condos will be the first residential building in SmartREIT’s 100-acre Vaughan Metropolitan Centre development called SmartCentres Place. 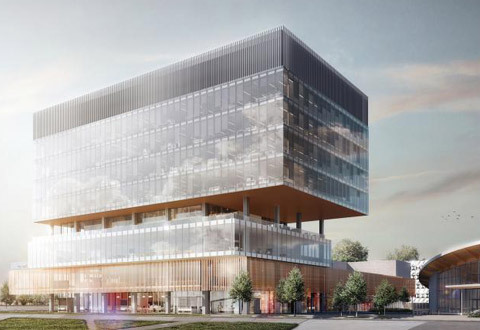 Smart Real Estate Investment Trust (TSX:SRU.UN) and Mitchell Goldhar today announced plans for a new Class-A office tower in the Vaughan Metropolitan Centre (“VMC”) with professional services firm PwC Canada as the lead tenant. 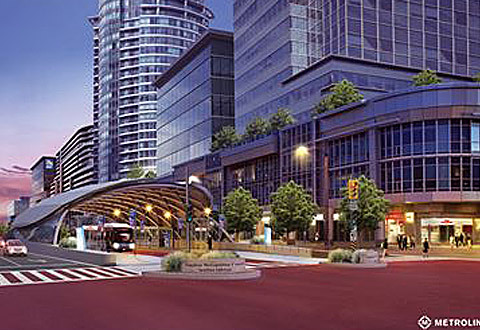 VMC is the new downtown of Vaughan at Highway 400 and Highway 7, a planning area envisioning 40 million square feet of density around new mass transit, including a subway station connected directly to downtown Toronto. 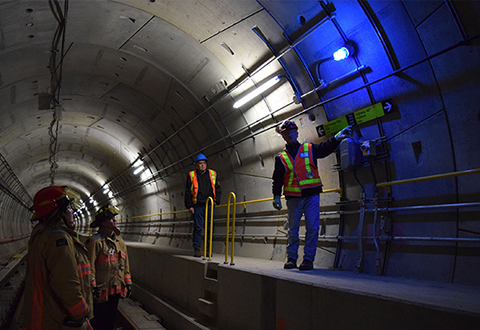 It’s a project that has been in the works for over a decade, but work on the TTC’s Toronto-York Spadina Subway Extension (TYSSE) is entering the final-year countdown as the transit agency aims to finish the $3.18-billion project by the end of 2017. 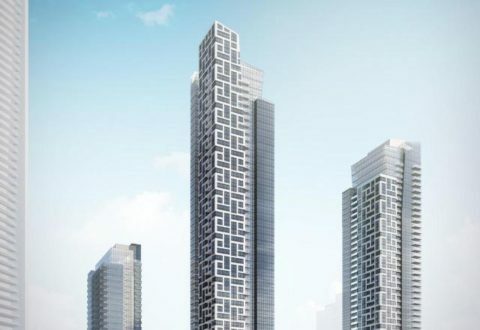 Smart Real Estate Investment Trust (TSX:SRU.UN) and Mitchell Goldhar today announced that they will soon be commencing marketing and development of the first high-rise residential project of approximately 700 units at SmartCentres Place in Vaughan. 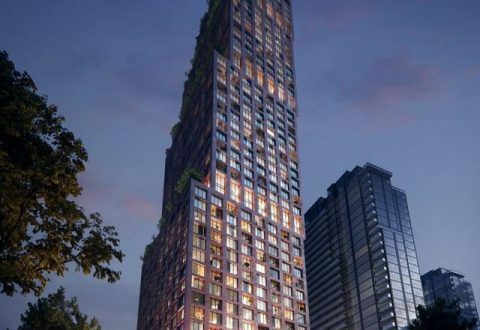 The residential project will capitalize on its excellent location, being close to the VMC subway station that is expected to be open and operational in December, 2017 and which will connect to downtown Toronto. 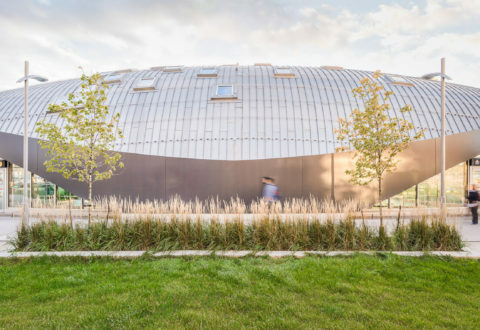 North of Toronto’s city limits, Vaughan’s new urban centre is rising at a SimCity pace. Spurred on by the planned 2017 opening of the Toronto Yonge-Spading Subway Extension (TYSSE), the 442-acre Vaughan Metropolitan Centre (VMC) presents an aggressive turn towards transit-oriented density for the sprawling municipality. 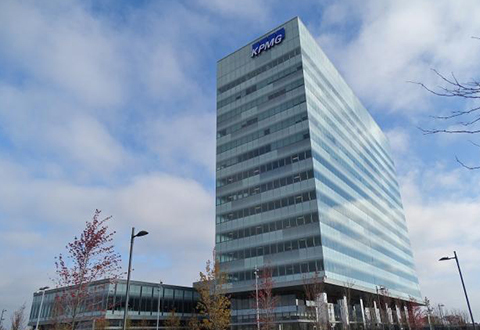 Smart Real Estate Investment Trust (TSX:SRU.UN) and Mitchell Goldhar announced today that they have signed a 10 year (plus two 5 year extensions) lease transaction with law firm Miller Thomson in the KPMG Tower at SmartCentres Place in Vaughan. The recently opened 360,000 square foot KPMG Tower is connected to the VMC subway station which is connected to downtown Toronto. The subway is scheduled to be operational in December, 2017. “Gosh, it’s cold out, isn’t it?” exclaimed York Region Chair Wayne Emmerson as he struggled to turn the pages of his speaking notes with frozen fingers and a steady gust of winter wind blowing his way. And cold it was—and muddy, too—as Emmerson and other federal, provincial and municipal dignitaries officially dug the first shovelfuls of earth to mark the launch of construction for a new York Region Transit bus terminal in Vaughan. Don’t call it a suburb: York Region, which has enjoyed the fastest population growth out of Canada’s 10 largest municipal jurisdictions, now boasts a population of nearly 1.1 million, and attracts up to 20,000 new residents every year. 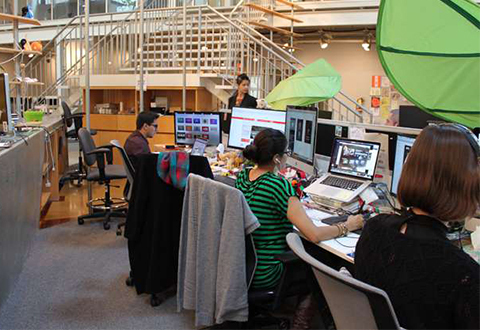 The region is a desirable place to work, too, with more than 50,000 businesses spread out over its nine cities and towns. 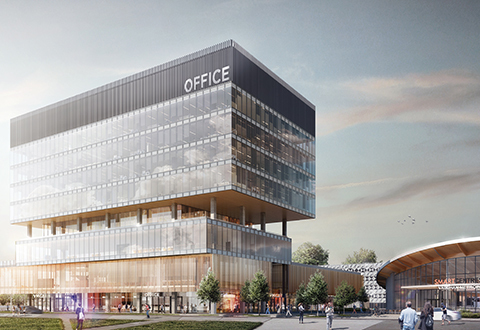 York Region isn’t just one of Canada’s fastest growing large urban municipalities, with close to 1.2 million residents and nearly 25,000 people choosing to move here each year it’s also Ontario’s second largest business centre bolstered by more than 50,000 companies. In fact, some of the country’s top talent is leading the charge in key economic clusters like financial, business, and insurance services, and information and communications technology (ICT). 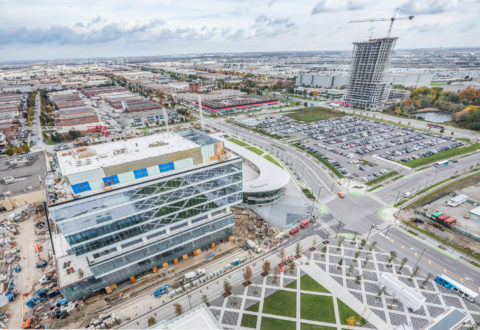 Vaughan’s eye-catching new bus rapid transit station, to serve future Spadina subway line riders and those living in the city’s emerging downtown core, is taking shape. Steel support beams that will hold up a 9.1-metre high and 50-metre long arched canopy that will cover the entire Viva Next rapidway station arrived at the site, on Hwy. 7 at Millway Avenue, Thursday. Clustered around the future TTC subway terminus at Highway 7 and Jane Street, the suburban community once known as the “City above Toronto” is now experiencing a more urban growth pattern. While sprawling subdivisions of single-family homes propelled much of the City’s explosive growth in recent decades, Vaughan is aiming to develop a more urban character, as high-rise developments spring up around the upcoming station at Vaughan Metropolitan Centre.